Desire. How do we define it? Or more importantly, what do we do with it? Many people believe that in order for us to be sanctified, desire should be denied: killed and buried. Others believe if you work hard enough, conjure enough faith and read Psalm 37:4 till it frays at the edges that your desires will come to pass. 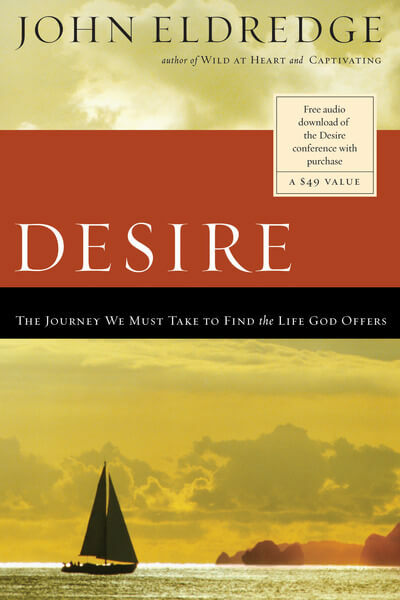 John Eldredge deviates from both of these popular standpoints to pull apart the true questions of desire – what it is, where it’s from, and how we deal with it in this life as God wills for us. We all have heart desires, and they are often a very private and protected part of our souls. So to read a book on this topic where the author made his own heart very vulnerable was quite a personal experience. It opened up old wounds and reawakened the pain of lost hopes and unfulfilled dreams. However, it was a cleansing and healing type of pain. Though it was – in some ways – a heartrending read due to the topic’s intimate nature, it carried a sense of hope. And this is the crux of the entire book. The only way to live with desire, is to carry it with hope for eternity. Our only hope for rest from the incessant craving of our desire is in God, and us united to Him. The best thing about this book is how well Eldredge takes the ethereal out of eternity. We don’t have an empty hope in heaven, but the assurance that though our yearnings may not be met on this fallen earth, they are guaranteed to be met to the full when we enter that Divine presence of God. You see, Scripture tells us that God has ‘set eternity’ in our hearts. Where in our hearts? In our desires. We are still left to live out our days in a world where desires are not always met. So what do we do till then? The author goes on to explain just how we are to “live hungry” without killing our dreams, and yet also live free from the burden of trying to arrange our lives. Jesus after all, appealed to everyone’s basic innate desires whilst He was on earth – he promised living water to the thirsty, bread to the hungry, an open door to those who knock, and discovery to those who seek. No matter our desire, the answer is always the same: Jesus. I highly recommend this book for many reasons: a better understanding of the reality we live in, and the heaven we’re headed towards, knowing how to hold our dreams and desires in open hands, and a better focus on the One who loves us and truly cares about our hearts desires. Desire is a well formulated and thoughtful read.